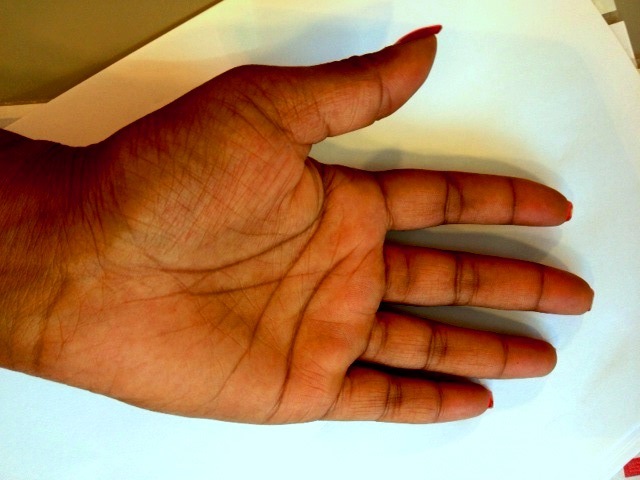 Does strong lines in your hands mean that you have a strong personality? The lines in my hand are very deep and dark. When i look the hands of my friends than they dont have strong lines just like me. My hands are ver y hard and tough. Not soft at all and i have a lot of hard skin on my hands and also very dry. can someone tell me if this is also to do with personality? You do have prominent, long lines. According to the principles of 5 elements Chirology, the flow of your lines is of the fire type and the length of lines is air. This means you have a strong personality and tend to spend a lot of time thinking. But you are not merely a thinker, you also like to put into practice what you think. learner wrote: You do have prominent, long lines. According to the principles of 5 elements Chirology, the flow of your lines is of the fire type and the length of lines is air. Its true what you said yes! Because of my strong personality and do what i think and say what i think i have a lot of problems Always because i am to much direct. I have a lot of temperament in me its not appreciated and thats why i am a lonely person. But i will and can not change my thaughts. When i tell my friends that they dont have strong personality i think i am to much direct too because they feel like that they are not strong. But i tell what i know and see in their hands. Thats why i asked a question about the lines most of the time i am sure about personalities and correct. Why are you lonely if you are married? roya96 wrote: Why are you lonely if you are married? I am not married and i never was. Ok sorry for the confusion, you mentioned wanting another child, so I assumed you'd be married if you wanted a child. roya96 wrote: Ok sorry for the confusion, you mentioned wanting another child, so I assumed you'd be married if you wanted a child. Your language is confusing but you seem to be angry at Ms. Anita. What she means is that she wants another child with her boyfriend. She does not want another boyfriend. When you have lines which are deep and well cut on the palm it means that you are 100% focussed on what you want and achieve it. This will however not work on personal relationship for in that you need a good heart line and the gap between the thumb and index finger should increase a little more. Your fingers are short and hence you are very impulsive and look at the broader picture in your life than working on the minute details. Re - child, can you post percussion pics of both the hands. Re your other question on the nature of the lines in your palm: It means you experience all the aspects of life very much. The hardness of the palm indicates that you possess plenty of physical energy and can bounce back quickly. These have to be blended with the other features of your palm to get to the accurate readings. Yes Strong lInes means strong personality . The heavy hand is giving more intence impact on strenth of lines. Its adding the fire quality with short fingers but for strength in personality we just do not see strong lines many more points are concidered . Your lines are too strong to be good. It depicts stress on different aspects of life - which you may attribute as strong personality. It is good that fate line is getting weaker - at least some stress is reduced. You need to take care health wise as you risk health problems. You need to relax and be easy with others affairs. Out of all lines, heart line might give problems, despite you perceive it as too strong.